Jenny and I have both been suffering from a number of muscular and back pain problems lately. We initially put it down to our lack of exercise and generally unhealthy lifestyle, and while that’s all too true, we eventually discovered that the mattress was the main culprit. The one that we have was the one we bought when we first got married, so we didn’t skimp, and got a fairly expensive model with a pillow top. This seemed like a good idea at first: it was comfortable, had good support, etc. Fast forward a few years and the pillow top was showing distinct signs of the many hours we’ve spent asleep. There were two body-shaped cavities caused by the sagging foam; these shapes were not “contoured to the shape of our bodies to maximise support, blah blah blah” but horribly uncomfortable averages of all of our sleeping positions over the years. We found that we’d be constantly be sleeping slanted no matter how we positioned ourselves on the thing, not to mention the hill in the middle. 10 year warranty? Bleh. Not covered. As a bargain hunter, my natural instinct was to go shopping for a new mattress. It’s then that I discovered the sad truth that almost all mattresses come with pillow-tops now – the manufacturers have got this scam down to a fine art (several sales people admitted as much to me). Unstitch the edge – relatively straightforward because it’s easy to see where the layers are, since the thing is literally just an extra layer sewn on top of the mattress. We tried to unstitch as little as possible but still ended up doing 2 adjacent sides. Detach the foam layer – our model used long thin plastic thingies to keep the layers in place. Y’know, like those things that hold tags onto clothes in the shops with a wide bit at either end and a stringy part in the middle. Yeah, that. I just used a hobby knife to cut them all. If you’re a little less fortunate yours might be glued on, which will require more effort to extract. Remove the foam layer – this is a lot harder than it sounds. The friction between the layers meant that it wasn’t simply a matter of yanking it out. That’s why we ended up having to unstitch two sides, so that we could separate the layers as much as possible and make it easier to pull. 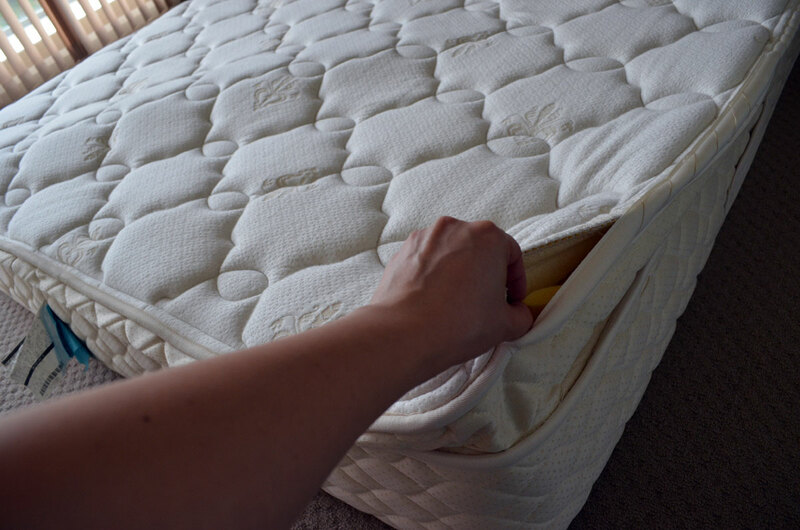 Sew the top back on – in theory you could just toss the whole thing and just buy a new mattress topper, pad or overlay to replace it, but on ours, the top layer had some foam cells and a thinner foam layer glued directly underneath. These probably wouldn’t have contributed much (if anything) to the sag, so we decided to keep it and sew it back on. Jenny comments that the stitching will require a thick and sturdy needle to get through the heavy fabric – the wee little one from your hobby sewing kit might not be good enough (or at least make it much more difficult). Better still would be a curved needle. End result: an almost good-as-new (firm) mattress, and anywere between $700 – $1500+ saved. Let’s be realistic about the results though. It’s not as if the springs themselves hadn’t sagged in 5 years – the middle still has some height to it, but it’s nowhere near as bad as it was with the foam. You can see the thin layer of foam I left in there after pulling out the rest. Thanks so much for posting this… very helpful. I too had searched in google about the problems with pillow tops and if people had successfully removed them. I purchased my pillow top (Sealy Eurocomfort) 3 years ago and loved it when I tried it out. Over the past 6 months to a year I started getting pain in the middle of my back, really tight muscles that never seemed to relax. I work in front of a computer all day and at that time was overweight so I attributed these symptoms to those issues. I recently dropped the weight and changed my posture at work and to be honest, my back issues got worse. In the back of my mind I knew it was probably the mattress (never had issues with old stiff mattress) but also didn’t want to spend another $1000 on a new mattress. After reading this article (and a few others: http://www.instructables.com/id/Hacking-a-Pillow-top-Bed/) I decided to jump in and remove the pillow top. Specifically the foam overlay. As soon as I cut around the pillow top layer (3 sides were needed) I had access to the foam insert and was successfully able to cut the white plastic thingies. I simply removed the foam and stitched the top layer back to the sides. I was lucky enough to have a thin pad on top of the pillow top so I didn’t have to put anything on top of the mattress afterwards. I’ve slept on this for 4 nights now and can’t believe the change. My middle back pain is gone. I highly recommend this to anyone who is not happy with their pillow top. Saved me money and a hassle. It only took me 45 minutes to cut out the pillow top and hand stitch everything back. Thanks Caesar! No worries, Chris. The added benefit is that you won’t lose any more sleep over throwing away a perfectly good mattress and buying a new one! Caesar, once you remove the foam layer can you then start flipping the mattress periodically like you would a non-pillowtop mattress? did you ever get an answer to this, im curious. I don’t think so because the bottom of the mattress is constructed differently and wouldn’t be very comfortable. Ah, sorry I missed your question! Like Vanessa says, you can’t flip the mattress because the pillow top ones aren’t designed with flipping in mind, so there isn’t a proper surface on the underside for you to sleep on. For example, mine has something like a stiff board at the bottom probably for mounting and supporting the springs. I have the same problem. After five years our pillow top is sagging and I’m laying here with chronic lower back pain. I was looking for the cheaper way out also. By cutting off the pillow top I could save on buying a new mattress. After all it’s just a normal mattress under the pillow top anyway. I am great full I have found your page and read what you have done. I also like the comment above. I am about to do the same. I am excited about having a firmer mattress and getting a good nights sleep, pain free. Glad to hear it, Allan! I am very picky with my mattress, just a thin layer of foam too much and it can be unbearably soft for me. I got a pillow top pocket spring mattress and found it slightly too soft resulting in me getting a tinge of backpain. So I just opened up the pillow top and took out the offending layer of memory foam. Now it’s perfect. I recommend to anyone that they should consider D.I.Y on their mattress if they don’t find it comfortable. Also I would suggest mattress toppers that come in many forms (latex, memory foam, normal foam) that can be great to replace old sagging pillow tops. Great advice, Mary. Thanks for popping by! Thanks for posting this. I’ve noticed that my mattress (which is less than a year old) has been bothering my back. I’ve been sleeping on the floor with a yoga mat and have noticed a dramatic difference. I’m going to follow up with the retailer, and if they can’t offer any reasonable solutions, try to remove the pillow top on the mattress. For those of you that have tried this, have the effects been long-lasting? Or do you find that it is more an issue of the innersprings which are no longer supportive? And would it be worth it to remove the pillow top to put on a foam topper to make the mattress feel more firm? Thanks again for the post, and any suggestions you can provide. Hey Ashley, since writing the article 3 years ago we’re still using the very same mattress, and it is entirely tolerable and it’s going on 7 years now – the springs naturally last much (much, much) longer than the foam layer. The warranty is supposed to cover the mattress for 10 years, however the fine print states that the foam layer height difference must be greater than 2cm (or an inch), which it wasn’t. But my body could clearly feel it. If you take out the foam the mattress will be very firm. But then you have the option of adding any kind of mattress topper (of any firmness or thickness you like), including memory foam or whatever takes your fancy. Then when that wears out, you can simply replace it without having to toss the entire mattress. Thanks for stopping by, Becky! As for a topper, I actually ended up liking the firmness so I went with a very cheap, thin foam topper from Target. I figure if it sagged, it could be replaced many times over before the cost started to bother me. how difficult is it to stitch the sides back? Do I need any special tools? Hi Michelle! It’s extremely simple and just requires a needle and thread. It also depends on how “neat” you want the final result to look – I personally didn’t really care much at all, since it’ll always be hidden under a bedsheet. So I just used a large needle with a course thread and just put enough stitches (about every inch or so) to close it up so that there weren’t any big gaps. You can actually see the beginnings of that in the photo: up near the top-right of the picture you’ll see the 6 diagonal lines where I started the stitching. Hope that helps! My Simmons Beautyrest mattress is less than 2 years old and after analyzing the sagging, I realized it was the pillow top and not the mattress, so the work began. (I weigh 120 lbs. so it shouldn’t have been sagging.) I made two 12″ – 14″ openings on each side and one 14″ opening on the bottom, with a sharp scissor. The foam was glued around the sides and in the middle and was very difficult to pry off and yank out (in pieces). The skin on my arms and hand is irritated, from reaching to the middle from each side, and scratching my skin on the stiff glue on the foam, plus my back aches – LOL. I hate to admit that I am approaching 70 y.o. I then stitched it with Coat’s button & craft thread, using a large, heavy needle. That wasn’t easy either, although I must admit that I did a great job stitching it evenly all around and it looks just fine. It was a full day’s work, however, my first night’s sleep was so much better and no back ache this morning! I am not sure whether or not I will need a topper and will decide after a week or two. Good luck and don’t be afraid to try it! That’s terrible how it started sagging after only 2 years! You went through quite the ordeal, but it sounds like the result was worth it! We bought out mattress 2 months ago from sleep country and it was a floor bed (thinking we would save money) and the sales lady said that we wouldn’t even notice a difference. We got it and it had 2 huge sage marks on both sides! We got the warranty but turns out they only “replace” it if it is more then 2in deep! And its 1.5in deep on both sides. Its so bad for my back that i have just been sleeping in my 2 year old sons twin bed! I am going to do this asap! Thanks for the tutorial!!!! You’re welcome! The warranty is such a scam, isn’t it? OK.I cut very careful around the pillowtop whole mattress with a sharp large razor scissors worked ok also Just be sure to leave enough to tuck under before gluing And after I took it off trimmed all the edges with some very sharp fine scissors. Let me join everyone else to say how we appreciate the instructions on removing the pillow top from our costly mattress from Macy’s. Although we had it for 9 years we have been putting foam rubber in the ditches that have developed over time. As back pain increased it finally dawned on us to do something about it. Our first thought had been a new mattress like Purple or Ghost, but this idea was brilliant and saved a lot of money. We haven’t slept on it yet but are looking forward to it tonight!!! My less than 8-year old pillow-top has had a hip divot for as least the past two years. After the bed was made up, it was apparent that it was sinking in the middle and I only weigh 130#. I tried the flat pillow fix, which worked somewhat but made the bed look odd. After following the different blogs on how to DIY modify, I finally got up the nerve to try. Figured the worst case scenario is I’ll have to buy a new mattress. I carefully undid the binding holding the top to the sidewall, I peeled back the top to find a 1 1/2″ egg-crate foam layer on top of the pocket coils. The pillow-top itself is a dense layer of foam quilted with a wool topping so I wanted to keep that. It was a bit of a job removing the thin foam layer as it was glued all the way around the mattress but once I removed it, I could see that the mid-section was thinner than the ends. Picked up an inexpensive poly foam mattress topper @ Walmart ($25+tax) – their only other option in something that thickness was memory foam and the double-width was too narrow – needed something 51″. I just laid the new topper over the springs, pulled the pillow-top back over, basted the sides back together, sewed the binding back on and it looks like new. Sewing the topper back to the sidewalls pulls the whole thing together. I’d suggest using a curved upholstery needle to do this – a straight needle works, it’s just more difficult. Looking at it now, you’d never know I’d taken it apart. I’ve now slept two nights on my modded mattress and can’t believe the difference! No hip soreness in the morning, no more stiff neck, no feeling as if I’ve climbing uphill to get out of bed and I’m now sleeping like the dead. I can’t believe it! All it took was an afternoon of my time and a $25 foam layer. I don’t know how long the fix will last but I don’t think a mattress should be ready for the scrap heap after less than 8 years use by a 130# woman, solely due to cheaping out on one thin layer of foam. Thanks so much for your article!! I had the thought to remove my terrible pillow top in the middle of the night and then today went searching for the answer and there you were! I plan on doing surgery on mine tomorrow! I feel relieved just knowing I can get rid of it. Never buy a pillow top again. Good luck with everything! Let us know how you go. Has anyone tried making the foam ‘forget’ by turning it over and letting the weight of the mattress recompress the foam? We have a heavy king size mattress with gulleys and thought about trying that when we go on vacation for a few weeks. It is too uncomfortable to sleep that way even with a topper but we thought it might work. When the mattress is springs up, wouldnt there be pressure on the foam hills to flatten them out? I’d love to know if anyone has tried this before dissecting the mattress! Did you end up trying it? How did you go? Hi, I had my mattress for 3 yrs N I suffer from sciatica A few herniations N my pillow top is killing my back.. Wat I don’t get is ” where do I seperate the stitching? Hi Ellie, if you take a look at the second photo, I unstitched the very top piece of mine – there was an obvious seam. The exact location of yours may differ, but there should still be a fairly clear section you could separate without actually cutting any fabric. This is brilliant! My husband and I bought a mattress just under 3 years ago after our wedding and it is starting to “divot” even though we rotate it (180 degrees) regularly as to not let our bums compress the foam too much. It’s already growing the “hill” in the middle & is terrible for our backs. I am so glad to have found this post and am looking forward to saving $$$ and our backs! Thanks everyone for sharing. I read this and several other sites about taking apart a pillow top mattress. All had some good comments. I decided to do some exploratory surgery by opening the seamed edge of the pillow top. I used a seam ripper and in a few minutes I could see the insides. The quilted top layer is some type of felt padding between the outer layer of fabric and an inner layer. Under that was two layers of foam of different densities. One was 1/2″ thick and the other 1″. they were glued to the inner fabric of the pillow top and the covering over the pocketed inner springs. My wife and I decided the foam layers were the cause of the too soft top. I used the seam ripper to open the entire edge at the foot of the bed. The foam was easily separated by running my hand sideways between the layers. I reached in as far as I could and then crawled in the rest of the way to release all the glue. When it was all released I crawled back out and pulled out the foam in one piece. The felt padding seems to be enough cushioning over the coil springs. We will try it for a few nights to be sure. If it works we saved over a $1000. We have a Cal King. The whole process took less than 1/2 an hour. Like many before me, I just wanted to say thanks for giving me the courage to go through with my own pillow-topectomy. Our $3000 name brand mattress was good for no more than 6 months before the sagging started, but given the sunk cost we stuck with it. After 4 years we were waking up with back and neck pain every morning we finally gave up on the thing. What was sold to us as a latex top was 1in of latex and 3in of cheap foam! Removed that, replaced with 1in thick high density “egg crate” foam, quilted top back over, and we’ve had our best nights’ sleep in years! This is great .. my dog dug at ours and the mattress now has a gaping hole. Does anyone know where I am able to purchase just the top from the mattress from? Not the ones sold in stores but the actual top of the mattress? I personally like the pillow top. I have called the Serta company itself with no luck and no results on google either.